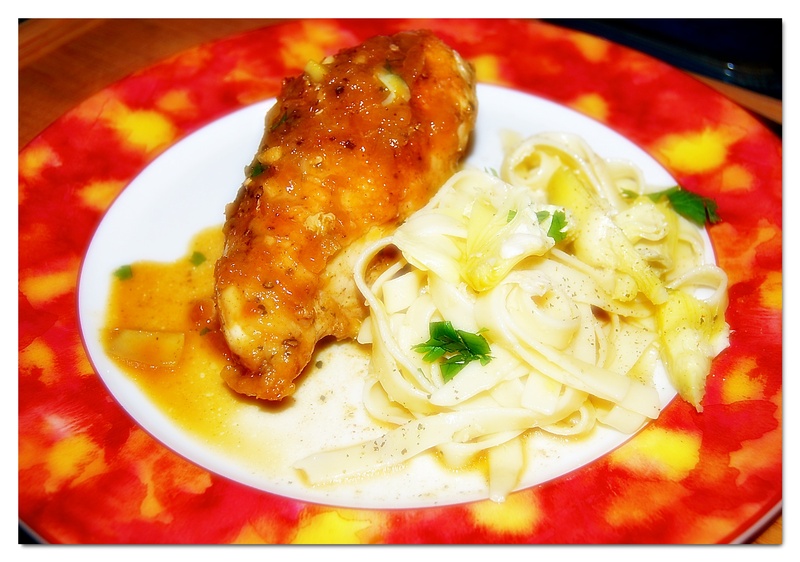 Perfect rainy night dinner a chicken that you will want to watch over and spoon the wine juices in the pan over the chicken pieces, that is to say anyone that wants a delicious simple family style dinner should carefully tend this luscious, saucy and juicy chicken. A side of flavorful fettuccine simply dressed with artichokes, a little butter (*butter optional, I prefer a splash of good EVOO) cheese and pepper. If you are lucky enough to find Bell’s poultry seasoning it is the perfect touch other than using fresh sage (looked rotten at the store) rosemary, oregano, ginger, marjoram, thyme, and pepper to season the chicken parts along with salt and pepper, lemon and garlic cloves. I had a few fresh herbs and the Bell’s offered me the sagey taste that I was looking for. Prep the chicken with rub seasonings, go easy on the Bell’s, salt and pepper and toss into a zip bag with lemon slices or small wedges, 2 tablespoons olive oil, and 5 medium cloves of garlic . Refrigerate for a few or several hours, turning and rubbing the chicken. When ready to brown the chicken, remove chicken pieces from the bag and reserve the marinade chicken left in the bag. Add oil, about 2 tablespoons, to a large 3 inch deep everyday type sauté pan, heat over medium high heat and add chicken pieces, skin side down, brown both sides, scatter one medium diced onion and one minced shallot over the chicken and pour in the contents of the zip bag, heat and add about 1 cup of wine, it will sizzle, stir to loosen the brown pieces and simmer on low heat and spoon the pan juices over chicken from time to time. As the wine reduces add another 1/2 cup of wine. 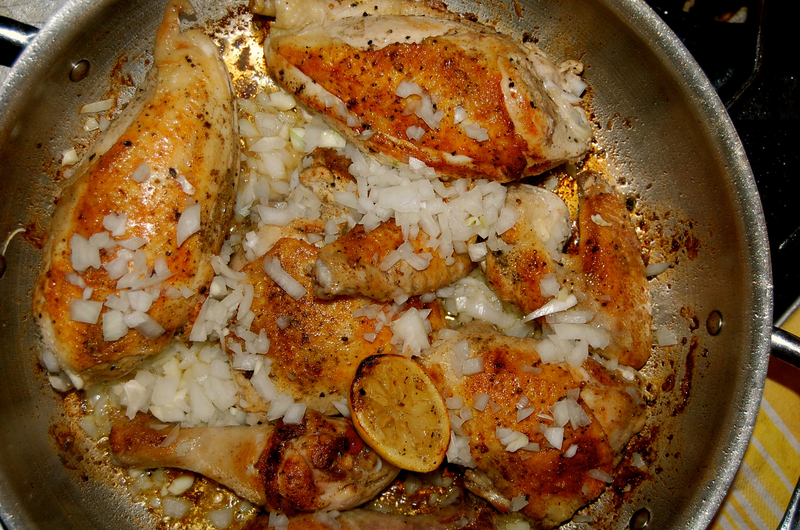 Do this at least 2 more times adding 1/2 cup wine each time spooning juices over until chicken is done. It took me about 30 minutes from start to finish for an almost 3 pound chicken and a little more wine for a little more sauce. Plate the chicken and pour sauce over.